Wednesdays are my tiredest days. I get home late, and if I’m going to have challenges with spinning it seems like they most often happen on a Wednesday. Today was a good example of that. 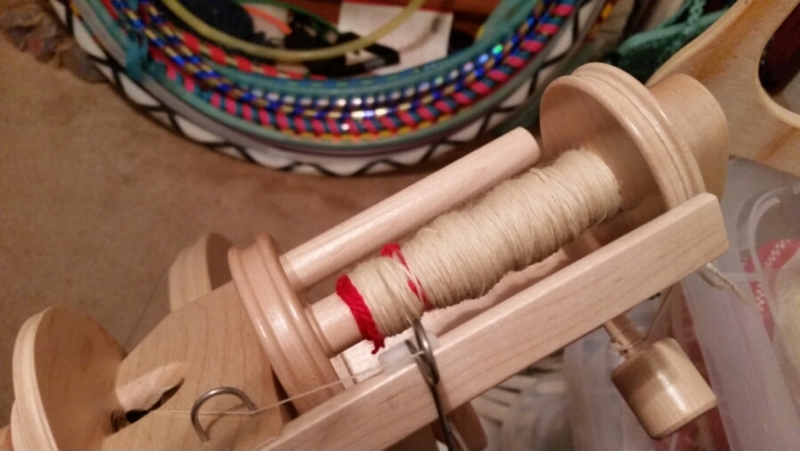 I started a new bobbin, and first the leader yarn was too loose on the bobbin and it wouldn’t take up. After I fixed the leader yarn then the tension was too tight and grabby, and what seemed like a very little tiny adjustment made it too light. And then the wool pulled apart, and I had to go back & pull the end off the bobbin and thread it back through, and THAT took several tries before I got it going again. Whew! Anyway, I finally got going and after that everything was fine.